This PG-rated Jerry Bruckheimer production is slick as an oiled weasel: larded with fancy special effects, canned romance, corny humor and a general lack of sophistication. 111 min. Walt Disney Pictures. Director: Jon Turteltaub. Cast: Nicolas Cage, Jay Baruchel, Alfred Molina, Teresa Palmer, Toby Kebbell. Kids who know their Horcruxes from their Grimholds may sniff at Disney's The Sorcerer's Apprentice, but odds are they'll enjoy this adventure at face value. This PG-rated Jerry Bruckheimer production is slick as an oiled weasel: larded with fancy special effects, canned romance, corny humor and a general lack of sophistication. In other words, it's an engaging-enough time-waster for kids that's not much of anything for adults. Even Nicolas Cage can't find inspiration here; in relatively subdued mode, he lets the costume do most of the work as the ageless, leather-duster-clad sorcerer Balthazar Blake. As the title character, Jay Baruchel goes through his loose-limbed paces. Dave Stutler appears to be a garden-variety geek, a Physics major working on a Tesla-coil project that would be at home in a Pink Floyd Laserium show. But beneath that unassuming exterior, Dave just might be the "Prime Merlinian" that Balthazar Blake has sought for centuries (think "Dalai Lama," with extra points for the geography pun on "prime meridian"). Balthazar and Dave first meet when the latter is a boy who stumbles into magic emporium Arcana Cabana: the boy's power is already apparent, but when he accidentally unleashes nasty sorcerer Horvath (that Prime Ham-phibian Alfred Molina), the good and evil magicians battle their way to a draw and wind up taking a decade-long powder. In the meantime, Dave grows up and goes to college, where he serendipitously reunites with his childhood crush Becky Barnes (Teresa Palmer), a blond beauty with a bothersome absence of personality. For symmetry, Balthazar has his own longstanding crush, on a character who's likewise poorly developed: trapped sorceress Veronica (Monica Bellucci). The strictly conventional good-versus-evil plotting serves as excuse for a string of CGI-enhanced magic "shows": a remote-control sword fight between Balthazar and Horvath, a car chase involving an enchanted 1935 Rolls Royce Phantom, a steel eagle from the Chrysler Building taking flight, and lots of back-and-forth hurling of balled lightning. The centerpiece sequence pays live-action homage to the Fantasia segment that lends The Sorcerer's Apprentice its title and, I suppose, its basic premise (itself adapted from a Goethe poem): Dave, left alone and dangerous, gives life to an army of mops that quickly run amok. The film begins with a complicated, rushed backstory positioning Balthazar, Veronica and Horvath as Merlin's lieutenants, the latter turning out to be a double agent for powerful sorceress Morgana le Fay (Alice Krige). This blur of exposition gives way to the film's most enjoyable leg, a second prologue with boy Dave (Jake Cherry) initiating the romance with Becky before unwittingly revealing himself to Balthazar and winning them a world of trouble. Once Baruchel turns up as the adult Dave, the wind in the movie's sails dies down and the plot settles into a familiar "grumpy mentor-klutzy student" dynamic. Though likeable and gifted as a physical comedian, Baruchel doesn't have much to work with here, and one suspects the movie would be at lot more interesting if Disney had stuck to the rumored original plan of Dave being a boy hero throughout the picture. Director Jon Turteltaub has difficulty making anything in the modern-day story land: the script squanders the intriguing idea of Horvath's Morganian apprentice Drake Stone (Toby Kebbell) having made a living as a Vegas-y magician, and both the comedy and romance turn out to be stillborn. That leaves the glossy action, which can superficially dazzle but never quite thrill due to the clunky characters and rushed plotting. Adults will shrug it off as mediocre, but they could do worse in choosing a children's matinee: there's enough in the film's string of magic tricks to fuel a child's dreams. 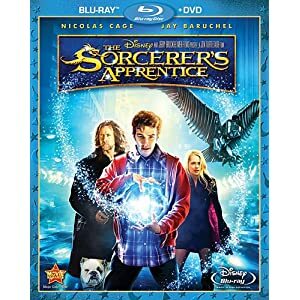 Disney stands behind its Blu-ray investment with yet another stellar hi-def transfer in its Blu-ray + DVD combo pack for The Sorcerer's Apprentice. Color is eye-catchingly bold (especially in a Chinatown confetti storm), contrast perfect, and light film grain intact, to prevent a too-digital look. Deep black level keeps the transfer consistently solid, and detail and texture are dazzlingly crisp. There's simply no complaining about the A/V quality here, as the DTS-HD Master Audio 5.1 surround mix goes toe to toe with the picture for clarity and impact: dialogue remains nicely prioritized over a thrilling soundscape that has an impressive wraparound effect, in both music and effects. Nine behind-the-scenes featurettes boast set footage and cast and crew interviews. "Magic in the City" (12:53, HD) focuses on the New York location shoot and production-design enhancements, with director Jon Turtletaub, producer Jerry Bruckheimer, Nicolas Cage, Jay Baruchel, Teresa Palmer, executive producer Chad Oman, Toby Kebbell, executive producer Barry Waldman, 2nd assistant director Peter Thorell, stunt coordinator/2nd unit director George Marshall Ruge, production designer Naomi Shohan, executive producer Mike Stenson, visual effects supervisor for Asylum Phil Brennan, set decorator George DeTitta, Jr, Alfred Molina, and special effects coordinator Matt Hawker. "The Science of Sorcery" (10:15, HD) explores the thin line between "magic" and science and how the latter informed the former in the film's concepts. Interviewed are Bruckheimer, Turteltaub, Cage, Baruchel, Molina, visual effects supervisor John Nelson, Brennan, Kebbell, Palmer, Monica Bellucci, visual leffects supervisor for Double Negative Adrian De Wet, screenwriter Matt Lopez, and Stenson. "Making Magic Real" (11:46, HD) picks up where the previous featurette left off by dealing with the film's practical effects that ground the magic sequences and blend with the CGI. Participants include Bruckheimer, Stenson, Baruchel, Turteltaub, Nelson, Hawker, Molina, special effects supervisor John Frazier, additional visual effects supervisor for Asylum Jason Schugardt, Cage, 2nd unit director of photography Patrick Loungway, Brennan, 3D supervisor for Double Negative Graham jack, 3D lead for Double Negative Zoe Cranley, supervising art director David Lazan, Shohan, animation supervisor for Asylum Craig Van Dyke, and CG supervisor for Asylum Bret St. Clair. "Fantasia: Reinventing a Classic" (10:13, HD) hones in on the titular sequence, as "reimagined" from Fantasia, and how it was interpreted by Turtletaub, Baruchel and the special effects technicians. Commenting are Bruckheimer, Cage, Palmer, Baruchel, Turteltaub, Stenson, De Wet, Nelson, Hawker, stunt double Thomas DuPont, director of photography Bojan Bazelli, 3D lead for Double Negative Georg Kaltenbrunner, animation lead for Double Negative James Lewis, and composer Trevor Rabin. "The Fashionable Drake Stone" (2:09, HD) chats up Toby Kebbell, Bruckheimer, costume designer Michael Kaplan, and Turteltaub about Kebbell's nasty character. "The Grimhold: An Evil Work of Art" (3:46, HD) looks at the design, execution and use of the Grimhold prop with Baruchel, Turteltaub, Molina, Bruckheimer, Shohan, Nelson, and Brennan. "The Encantus" (2:23, HD) does the same for the big ol' book, with Turteltaub, Baruchel, property master James Mazzola, Shohan, and Lazan. "Wolves & Puppies" (3:07, HD) records the presence of furry things on the set, with Bruckheimer, Turteltaub, Baruchel, visual effects data wrangler Tyler Ham, and animal trainer Steve McAuliff. "The World's Coolest Car" (1:32) explains how the 1935 Rolls Royce Phantom used in the film belongs to Cage (though it's often stunt doubled). Interviewed are Turteltaub, Bruckheimer, Oman, Baruchel, Rolls Royce coordinator Dan Dietrich, and picture car coordinator Michael D. Antunez. Five "Deleted Scenes" (7:47, HD) add more detail to Balthazar's search for the Prime Merlinean, Dave's klutzy classroom science experiment, and Dave's attempts to win over Becky. There's also a set of crack-up "Outtakes" (3:14, HD), "Discover Blu-ray 3D with Timon & Pumbaa" (4:23, HD), and BD-Live access to send viewers to additional online content. Last but not least, there's a DVD copy of the film that includes some of the extras. All site content © 2000-2019 Peter Canavese. Page generated at 04/18/2019 05:41:10PM.